Wow, very interesting to read! I'm one of "those" who would have wondered about this and a large family, so thanks for answering the big Q. Looking forward to food shopping/cooking next! Sounds like you have an awesome laundry room! 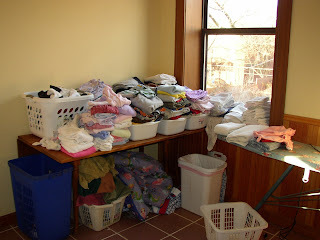 Mine is in the basement, but I usually take all the dry clothes upstairs and dump them on my bed to fold. Funny how everyone has their own system that works for them, even us "big" families. I HAVE to do laundry more times per week! That's just the way I work! Glad you found what works for you! I am not giggling; I am actually very, very impressed. 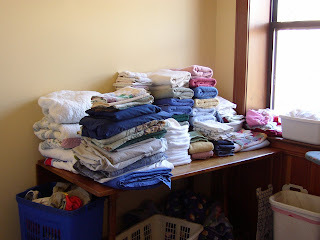 Your laundry load is very similar to mine, but I run a load through daily instead of saving it up. I like your method! it's ok. You can admit you giggled a little. I have the luxury of a second floor laundry room (in a renovated 110 year old two-family house that has been converted into a single family residence no less). Mine even has a balcony, however mine is nowhere near as nice as yours! If it was, I think I would want to spend 2 days in that room (I would need chocolate though). It sounds like an efficient and therapeutic system. I am doing the 1-2 loads a day system right now, although I do have "catch-up days". Hey! Where do you live? !